This newly re-furbished two level Townhome faces the forest and is a great vacation get-away for guests of all ages. On the entry level is the open living and dining area with a fireplace to warm up by on a cold winter evening, flat screen TV with DVD and Roku. The living area also offers a cozy sitting area and a balcony which looks out into the forest. The kitchen is well equipped and is open to the living/dining area so everyone can visit while the cook is busy creating a meal. This level also has a bedroom with Queen sized bed and TV, a full bathroom with tub/shower, and laundry closet. Up one more level you will find the second bedroom with a Queen sized bed and a loft with ladder that has a double futon, a full bathroom with tub/shower, and an open area that looks over the living room and has a bunk bed, sofa sleeper, TV, DVD and a Foosball table which will also turn into other table games. The Carnelian Woods complex offers an Olympic sized swimming pool, two outdoor spas, lockers, saunas, a game room, tennis courts, bocce ball courts and a video arcade. The condo is only a block to Patton Beach, Watermans Landing Cafe, paddle board and kayak rentals, Magic Carpet Miniature Golf, Garwoods Grill & Pier, CB's Pizza, 7-Eleven and the Old Post Office Cafe. Almost equal distance to Alpine Meadows, Squaw Valley, Homewood Mountain, and Northstar. Safeway grocery and Old Brockway Golf course are minutes away. This was a very nice townhouse to stay in, it was close to Tahoe City where you find a lot of great places to eat as well as great shopping. We love the wooden boats and had a wonderful time at the boat show. Definately would stay here again when visiting Tahoe. 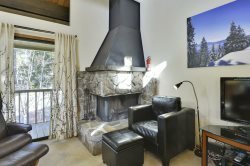 Lovely property, so spacious for our family and convenient to all of Lake Tahoe! We loved the small coves around the lake and in the state parks for swimming. Rented sups at sugar pine state park and paddled south past the campgrounds to rock jump. We had a blast living in the townhouse near Kings Beach. Very close to the lake and well-quipped. We really enjoyed grabbing a quick bite to eat for breakfast at the cafe at Waterman's Landing. For food, La Mexicana, across Kings Beach, behind the main blvd. And then the ice cream/fro yo place within a block on the main road - Tahoe time I think - great stuff. $4/$6/$8 for different sizes of fro yo - unlimited toppings - total winner. Activity - Kayak/SUP from Sand Harbor - go along the East shore, through boulders, and incredible emerald waters, coves and jump off spots that will make you want to come back over and over. It's like the Caribbean with the colors, the beauty, slightly cooler water, no salt, no corals or tropical fish. Then hang out in divers' cove area and swim, explore, jump, swim - what a great park. Jumping off the pier at Kings Beach was also a hit!